Attention deficit hyperactivity disorder (ADHD) affects millions of adults and children, and it is a common childhood disorder. Are you or your child suffering from this disorder? 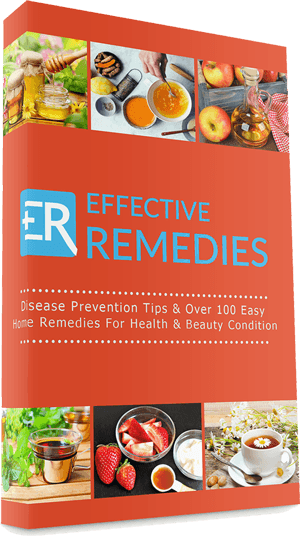 Are you looking for the natural and safe ways to get rid of it? 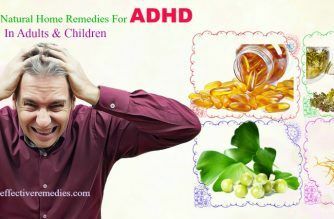 Here are the most effective home remedies for ADHD in adults and children. Keep reading to know more about ADHD, and its causes and symptoms. AHDH is a complex difficulty, characterized by inattention, impulsive behavior, and hyperactivity. 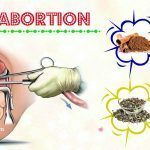 In the US, it impacts approximately almost 5 percent of adults and 11 percent of children. It causes difficulty in controlling and focusing in many aspects of life. Children with ADHD may be unable to manage their impulses and are hyperactive. Adults with ADHD can have difficulty being organized, managing time, holding down a job, and setting goals. They can also have problems with self-esteem, relationships, and addiction consequently. 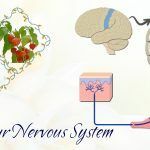 Factors that can contribute to its development include central nervous system issues, environmental factors, and genetics. Other risk factors are smoking during pregnancy, alcohol use, exposure to environmental toxins, premature birth, maternal drug use, and maternal exposure to environmental toxins. 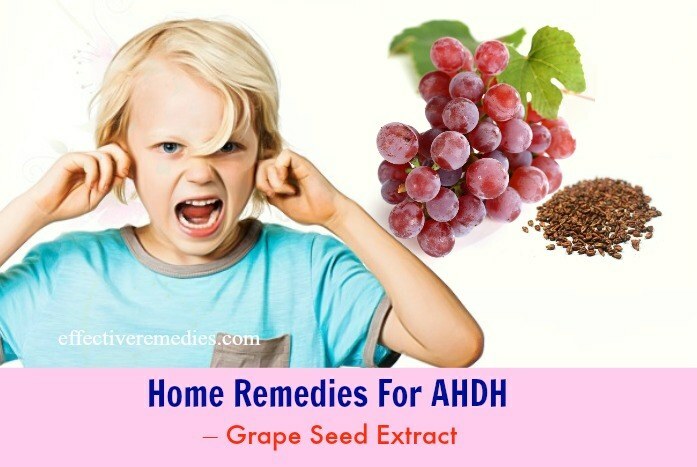 Below are the best natural home remedies for ADHD, which are suitable for both adults and children. If a kid or any individual suffering from this condition is allergic to any of the ingredients of the home remedies, don’t use the remedy recommended. Also, contact a doctor before you decide to follow any remedy. 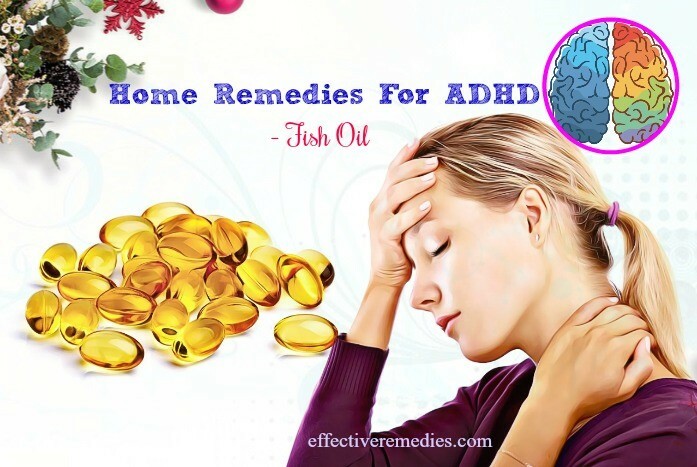 Fish oil is an ideal remedy for alleviating the symptoms of ADHD in adults and children. According to experts, a deficiency of polyunsaturated fatty acids can lead to psychiatric and neurodevelopmental disorders such as dyslexia and ADHD. Thus, you should choose a fish oil supplement that is rich in EPA (omega-3 fatty acids) and DHA (omega-6 fatty acids). It can help reduce symptoms of ADHD. Other than that, fish oil supplements are helpful for improving memory and concentration. For the best dosage, consult a doctor. Besides, it is best to eat trout, salmon, sardines, pumpkin seeds, flaxseeds, etc., because these foods are high in omega-3 fatty acids.  These two herbs are essential components to the list of natural home remedies for ADHD in adults and children. Ginseng is an herbal remedy that comes from China. It contains a reputation for increasing energy and stimulating brain function. The “red ginseng” consists of some potential to soothe symptoms of ADHD. Ginkgo biloba, on the other hand, is perfect for improving focus, cognition, memory, knowledge retention, and perception . 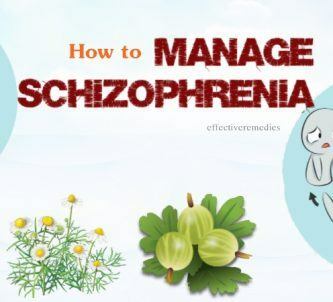 A study showed that symptoms improved for individuals with ADHD who used a ginkgo extract. Besides, it also helps to protect the brain from toxins . For children or adults, dosages of ginseng about 200 mg daily. Dosages of ginkgo biloba can range from 120 to 600 mg a day for adults and 30 to 100 mg daily for children. Children who have ADHD have problems such as difficulty waking up in the morning, sleeping soundly, and falling asleep . A cup of herbal tea may be helpful. Herbal teas containing chamomile, lemongrass, spearmint, and other flowers and herbs are one of the safe options for adults and children. They can help encourage sleep and rest. Boil a cup of water and later turn off the heat. Let it cool for one minute or more. After that, add three teaspoons of dry chamomile flowers, lemon grass, or spearmint to it. Cover and steep for around ten minutes. Finally, strain and sip this herbal tea before hitting the bed. Massage is another effective remedy for people having ADHD. According to a 2003 study, twenty minutes of massage two times weekly has a positive effect on behavior and mood . Apart from that, regular massage is also beneficial for increasing serotonin levels, which help to modulate elevated dopamine levels occurring in children having ADHD. Get some almond, sesame or olive oil and put it on your hands. Then, make the oil warm by rubbing your hands together. 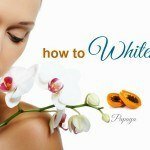 Start massaging this mixture onto the skin. Leave the oil to soak in for several minutes and finally, remove the remaining residue. Try this remedy at least twice in a week. Regular physical exercise can fight against anxiety, stress, negative affect and behavior, depression, poor compulsive behavior, and impulse control while improving better memory and executive functioning, as per a 2012 study . Plus, doing exercises in green, open spaces is highly beneficial for boosting brain function in individuals with ADHD. You and your child should spend at least half an hour daily performing the highly active exercise. Swimming, bike riding, and swinging are a few exercises that most children like. Also, taking part in gymnastics, dancing, martial arts, and ice skating is a great choice for many people. Also, you can take your child jogging, walking, and do strength-training exercises. Regular practice of yoga or tai chi is one of the excellent home remedies for ADHD in children and adults. The physical postures, deep relaxation techniques and breathing exercises used in yoga are useful in calming and strengthening the central nervous system. Yoga can help children learn discipline, thereby managing ADHD symptoms. Tai chi is also perfect for improving symptoms of ADHD. A 2013 study indicated that children who enrolled in tai chi classes two times weekly improved conduct, displayed less anxiety, less hyperactivity, less daydreaming behaviors and less inappropriate emotions . Register a tai chi or yoga class. Also, study them using videos. Practice these arts for around 20 to 30 minutes every day. Wheatgrass is a superfood you should add to your diet. Wheatgrass contains the essential amino acids, chlorophyll, vitamins, and minerals, which all work wonders in supporting proper brain function and hormone balance. Add one tablespoon of wheatgrass to oatmeal. Include wheatgrass juice or powder in vegetable soup. Brahmi is used as a natural alternative treatment for ADHD in Ayurveda. It also improves the mental balance in ADHD patients and brings hyperactivity under control to keep the normal activity levels. Additionally, it is also potent in improving word recall memory and reducing depression and anxiety . 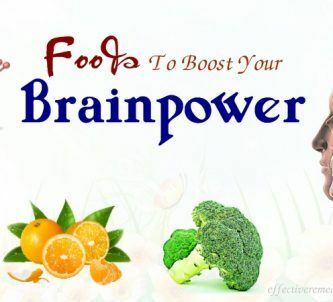 Other than that, it rids the brain of free radical damage and enhances cognitive function. Use brahmi powder or capsules for daily consumption. Consult a doctor for proper dosage. Add brahmi powder to the milk or normal cold drinks and consume one time in a day. Mix one teaspoon each of organic honey and brahmi powder. Then, take this mixture two times daily. Grape seed is abundant in antioxidants that help protect the body from free radicals that disrupt normal body functioning and cause premature aging. In particularly, grapeseed extract helps to remove harmful effects of toxins from the brain. 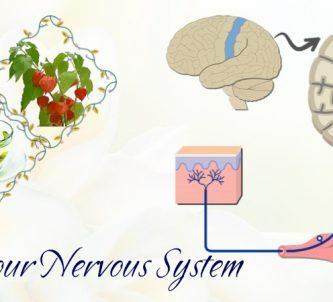 It also strengthens blood flow system of the brain and makes sure it receives enough amount of nutrition. You can use a grape seed supplement or add its extract to the daily food. Alternatively, eat fresh or dried grapes. You can also use grapeseed oil to help calm the mind. Just inhale the vapors and soothe the mind instantly. Green oats or wild oats or avena sativa is considered as a good food for reducing ADHD in both adults and children. It has a sedative impact on the nervous system and functions as a brain tonic. Many studies show that green oats are beneficial for boosting concentration and attention . It additionally calms nerves and treats stress and anxiety. You can use green oat extract after consulting your doctor. Lack of certain types of foods may worsen symptoms of ADHD in adults and children. Eating a well-balanced, healthful diet with a lot of fresh fruits, vegetables, and whole grains is beneficial for everyone, particularly people suffering from the problem of ADHD. Diet plays a crucial role in curbing the symptoms of ADHD. Eat foods rich in protein such as eggs, beans, nuts, fish, soy and dairy products. 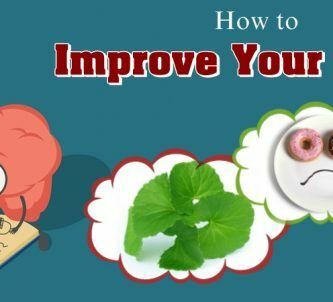 These foods increase the dopamine production, helping an individual stay focused. Add magnesium-rich foods such as spinach, pumpkin seeds, Swiss chard, sunflower seeds, cashews, black beans, and soybeans to the diet. Magnesium is effective at decreasing irritability, increasing attention span and minimizing mental confusion. A lack of zinc is related to ADHD, so add foods rich in zinc to the diet. 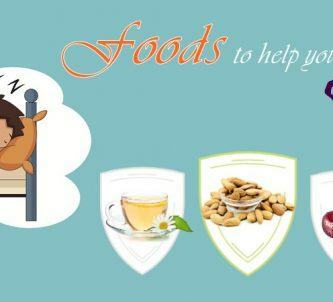 Zinc-rich foods include oysters, cheese, liver, sesame seeds, peanuts, and squash. Foods high in vitamin B6 will help combat irritability. Vitamin B6 rich foods are avocados, spinach, bananas, sunflower seeds, nuts, and prunes. Complex carbohydrate foods low in sugar and high in fiber, help to stabilize blood sugar levels, thus managing ADHD symptoms. Remove foods with artificial sweeteners, artificial colors, preservatives, and flavorings from your diet because these foods can lead to learning disabilities and hyperactive behavior. Although all the above home remedies are helpful for managing ADHD, it’s better to seek a doctor’s advice before using any of these. 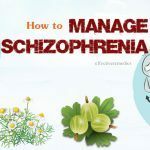 You can share your experience with other readers if you know other natural home remedies for ADHD in adults and children. Also, let us know if you have any query. All content provided are for informational & educational purposes. We recommend you consult a healthcare professional to determine which method is appropriate for you.